LONDON, England -- Defence Secretary says Ukraine’s eastern border still at risk from Vladimir Putin and promises UK will offer support for as long as it is needed. 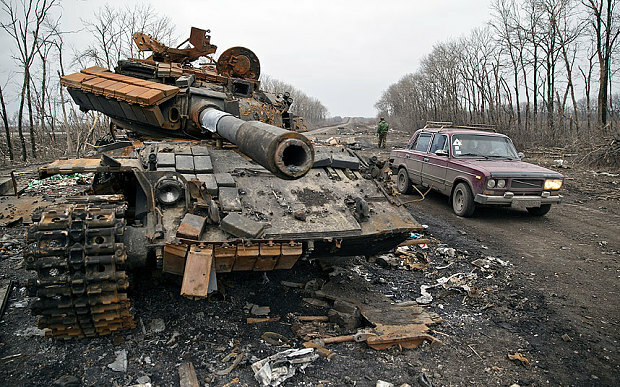 A destroyed tank at a former Ukrainian army checkpoint. Ukrainian forces have repeatedly asked for anti-tank weapons and anti-artillery radar from Britain and America. Ukraine conflict is a “red hot” war that shows no sign of ending soon, the Defence Secretary warned as he announced Britain will step up training to Ukrainian forces fighting Russian-backed separatists. The Ukrainian military said it repulsed an attack by 400 rebels backed by tanks who assaulted its positions there on Monday morning. Shelling was reported to be continuing in the area on Tuesday. Eduard Basurin, a military spokesman for the self proclaimed Donetsk People’s Republic, denied breaking the ceasefire and said at least one civilian had died in an “unprecedented” Ukrainian artillery attack near Starohnativka. “The command of [Ukraine’s] anti terrorist operation continues active preparations for a large-scale offensive against the Donetsk People's Republic,” Basurin said at a briefing. Starohnativka is important because it shields the Ukrainian-controlled section of the Donetsk to Mariupol highway. Ukraine fears that Mariupol will be the separatist’s next strategic target if they renew offensive operations. One Ukraine soldier was killed and 13 injured in the past 24 hours, Alexander Motusnyak, a government spokesman, said on Tuesday. A small British force of 75 soldiers working in teams across the country will step up training Ukrainian troops in urban combat, dealing with mines and creating stronger fortifications, Mr Fallon said. The troops have trained 1,000 members of the Ukrainian army and national guard so far and aim to train 1,000 more by the end of the year, he said. He said he did not expect the conflict to end “anytime soon”. The Minsk ceasefire deal signed in mid-February has failed to stem the violence and both sides regularly accuse the other of violating its terms. Mr Fallon said: “Since the Minsk peace agreements themselves have been signed, around 200 Ukrainian soldiers have lost their lives and around 2,000 have been injured. So this is not a frozen conflict and we are not going to turn our back on Ukraine. He said as long as Russia keeps heavy weapons in the Donbass region and significant numbers of troops, “you can’t rule out this continuing threat to Ukraine’s eastern border”. Britain’s training mission was not provocative, he said. Ukrainian forces have repeatedly asked for anti-tank weapons and anti-artillery radar from Britain and America to stop the onslaught from the well-armed, Moscow-backed rebels. The United States says the separatists have launched more attacks in recent days than any similar time period since February.